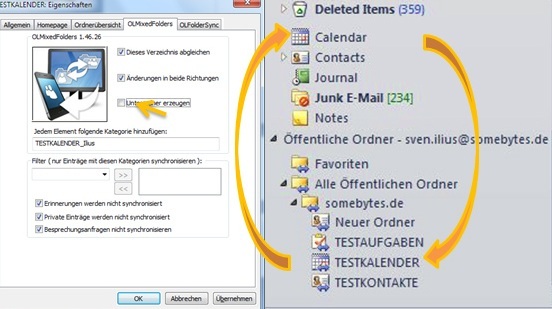 How does OLMixedFolders get the content of the public folders to the mobile phone? Which allows you to handle your business contacts directly on the phone. OLMixedFolders is a Com-AddIn for Outlook that synchronizes default folders (calendar, tasks and so on) with public folders or subfolders in both directions. OLMixedFolders prepares Outlook in that way that you can still use your usual synchronizing software of your telephone producer which probably can only synchronize the default folders. 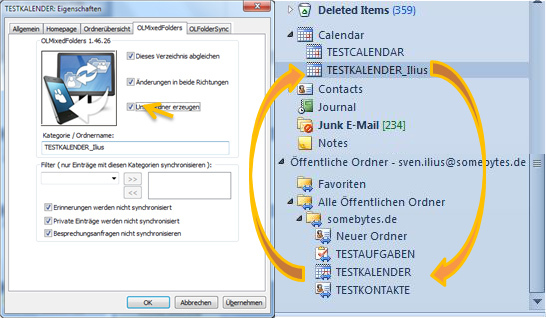 To make this possible OLMixedFolders assigns to each element in the public folder a category which you can chose freely. This category is necessary for the allocation of the entries to the respective public folders. Afterwards, the entries of the public folders will be copied into the default folder. Furthermore, all elements of the default folder that have the corresponding category will be copied in the public folder, provided that you have chosen “in both directions” in the configuration. Now, the elements will come via the existing telephone synchronization software to the telephone (f. e. ActiveSync). Since version 1.46 OLMixedFolders can also create public folders as a subfolder of your default folder. It will be synchronized with your synchronization software or your exchange account to the default folder. Afterwards, it will be recognized by OLMixedFolders and it will be synchronized with the respective public folder which will be identified by the availability of the category.